A clerk who took bribes while working at a London court and became the first person convicted under the Bribery Act has been jailed for six years. Munir Yakub Patel, 22, worked at Redbridge Magistrates' Court at the time of the incident in August. Patel, of Green Lane, Dagenham, took £500 to avoid putting details of a traffic summons on a court database. He admitted one count of bribery but the prosecution believe he earned at least £20,000 by helping 53 offenders. Patel was sentenced to three years for bribery and six years for misconduct in a public office, which he also admitted at Southwark Crown Court last month. He will serve both sentences concurrently. Between February 2009 and August 2011 he also gave people advice about how to avoid being summoned to court over traffic penalties. Sentencing him, Judge Alistair McCreath told Patel his offences were a "very substantial breach of trust". He said: "Your position as a court clerk had at its heart a duty to public confidence in it. The judge added: "This indictment represents misconduct which lasted well over a year and involved at least 53 cases in which you manipulated the process in order to save offenders from the consequences of their offending - fines, penalty points and disqualification. "These were not instances in which you were approached and corrupted by others. "On the contrary, you sought out people and suggested to them that, for payment, you could help them out of their difficulties," the judge said. Patel was arrested after The Sun filmed him arranging the bribe to prevent a traffic penalty for speeding being entered on a legal database. 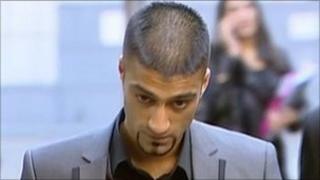 Motorist Jayraj Singh, who contacted The Sun after being approached by Patel, was commended by the judge. The court heard Patel warned Mr Singh his insurance would go up if he was convicted and in another text message added: "I only do this for Asian bruvs. I do this all day long." Caroline Haughey, prosecuting, said this case was "but a drop in the ocean". The court heard Patel himself evaded a penalty by returning his summons, which arrived by the post, by attaching a note reading "Not of this address". Prosecutors believe Patel resorted to this "sophisticated" ruse in many cases. He is also believed to have supplied drivers with blank invoices from a north London garage to use as false proof their vehicle had been at the garage at the time of the alleged offence, the court heard. The court heard it was likely Patel's offending was "not limited to the cluster of courts in which he worked" but extended across north London. The new Bribery Act, which came into force on 1 July, made it illegal to offer or receive bribes, and to fail to prevent bribery. Before the new law, similar regulations dated back to 1906 but the Bribery Act also covers bribing a foreign public official and a corporate offence of failing to stop a bribe on behalf of your organisation. Bribery: What is it and what's the penalty?